Raffles Singapore is currently closed for restoration with a planned reopening in the middle of 2019. During this time, The Fullerton Hotel Singapore, just 3 km away, will welcome your stay to Singapore. The Raffles Singapore rose from humble origins as a small seaside hotel that first operated in the late 1800s. When its owner died, the famed Sarkies Brothers acquired the building to develop a luxury hotel in Singapore. Reopening as the “Raffles Hotel” in 1887, the business became one of the most sought after destinations in Southeast Asia. Its rise in popularity caused the brothers to expand the hotel to the point where it was among the most advanced for its time. Countless well-known luminaries frequented the Raffles Hotel, including Rudyard Kipling, Elizabeth Taylor and Ava Gardner. Despite enduring great hardships wrought from the Great Depression and World War II, the Raffles Hotel managed to preserve its prestigious international reputation for over the last 130 years. 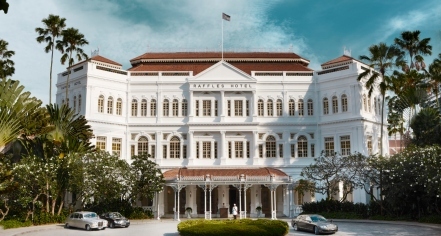 Celebrated today as the Raffles Singapore, the hotel is now a cherished member of AccorHotels. All of the hotel’s 115 lavish accommodations still appear as they did during the 19th century with their original 14-foot ceilings, double-glazed windows, and polished teakwood floors. The Raffles Singapore is also a celebrated culinary destination with its five distinctive restaurants and two sophisticated bars. A number of celebrity chefs call the Raffles Singapore home, concocting a brilliant array of Asian and European meals. The hotel’s Raffles Spa offers the services of expert massage therapists who offer an enticing array of treatments inspired from across the world. And with its stunning views of the sea and cityscape, the Raffles Singapore is the perfect location from which to host any important occasion. Originally founded in the early 19th century as a British colony, Singapore has rapidly evolved into one of the world’s most influential communities. This vibrant island country offers an exhausting collection of cultural attractions to experience. Surrounding the Raffles Singapore are a multitude of renowned international landmarks, including the UNESCO-recognized Singapore Botanic Gardens. Other amazing places, such as the Asian Civilizations Museum and the National Museum of Singapore, are close to the hotel, as well. Despite its small stature, Singapore enjoys an enthralling abundance of culture, history, and vibrancy. Raffles Singapore, a member of Historic Hotels Worldwide since 2018, dates back to 1887. Raffles Singapore is home of one of the famous Singapore Sling cocktail, which was invented by Ngiam Tong Boon, a bartender at the Long Bar. Airport Transportation: An airport shuttle may be arranged through the hotel's concierge, rates may apply. Cancellation Policy: Depends on package booked by guest, as some packages require full payment and are non-refundable. Deposit: A deposit is required. Early Check-In/Late Check-Out: Available, fees apply. Occupancy Restrictions: Two (2) adults and two (2) children or three (3) adults unless booking the Two Bedroom Suite. Parking: On-site parking is available. Self-parking: 6 SGD; Valet-parking: 25 SGD. Smoking Policy: Smoking is only allowed in designated areas. Raffles Singapore is currently closed for restoration with a planned reopening in the middle of 2019. During this time, The Fullerton Hotel Singapore, just 3 km away, will welcome your stay to Singapore. The Raffles Singapore rose from humble origins as a small seaside hotel that first operated in the late 1800s. 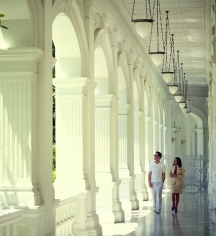 Learn more about the History of Raffles Singapore .